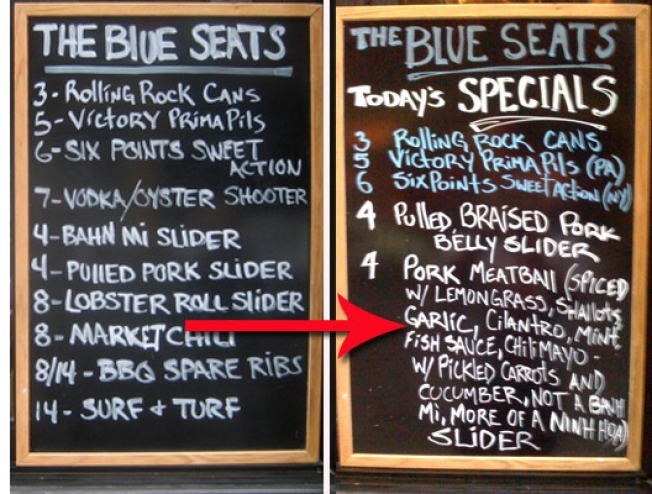 Yesterday, we proved that without a doubt, New York's banh mi trend ended when LES sports bar Blue Seats added "bahn mi sliders" to their menu. Today, the bar has yielded to the will of the people...kind of. They have since renamed the sliders "Pork Meatball (spiced w/ lemongrass, shallots, garlic, cilantro, mint, fish sauce, w/ pickled carrots and cucumber, not a banh mi, more of a ninh hoa) slider." That about settles it then!